$10 Gift Card Giveaway Contest!!! Begins Now Ends 12AM EST!! 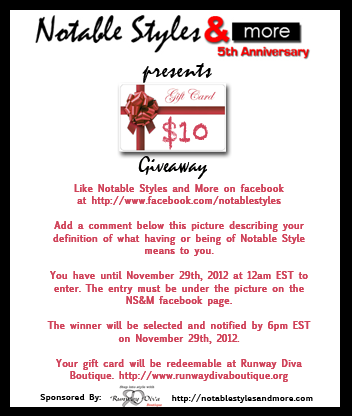 Excited as we are to continue the 5th year anniversary celebration of Notable Styles and More, it is now day 3 and time for a contest, WOO HOO!!! 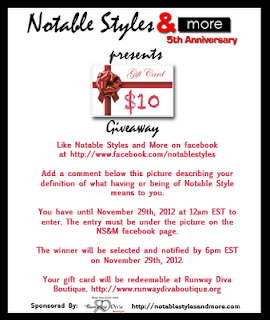 You can win a $10 gift card to Runway Diva Boutique in Indianapolis, IN by following the directions on the image posted. The contest rules are also posted below. But you must have a facebook account to enter. What does having or being of Notable Style mean to you? If you do not have a facebook account or would just prefer to share your thoughts on this question here please do so in the comments section. Add a comment below this picture describing your definition of what having or being of Notable Style means to you. You have until November 29th, 2012 at 12am EST to enter. The entry must be under the picture on the NS&M facebook page. The winner will be selected and notified by 6pm EST on November 29th, 2012.